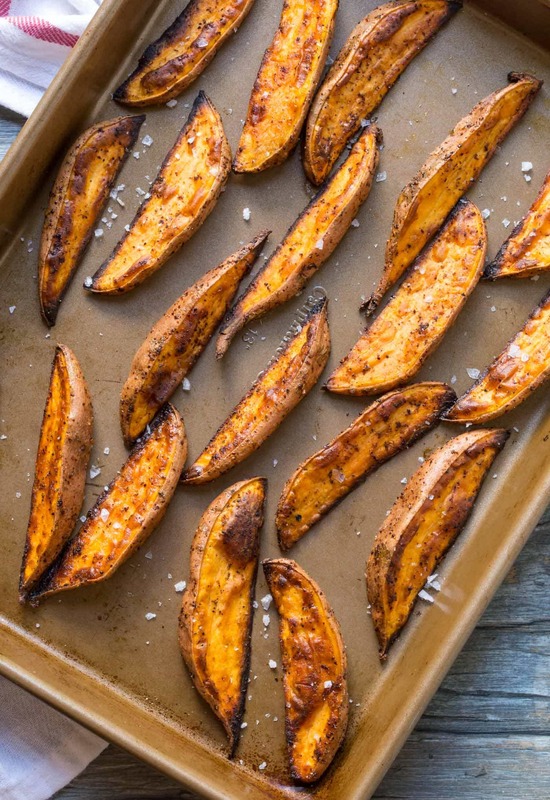 Up your appetizer game with these simple, oven roasted Spicy Sweet Potato Wedges! Something magical happens when you roast vegetables. Their natural sugars caramelize and even the veggies you would never consider sweet (broccoli or cauliflower, anyone?) taste almost like candy. I kid you not. 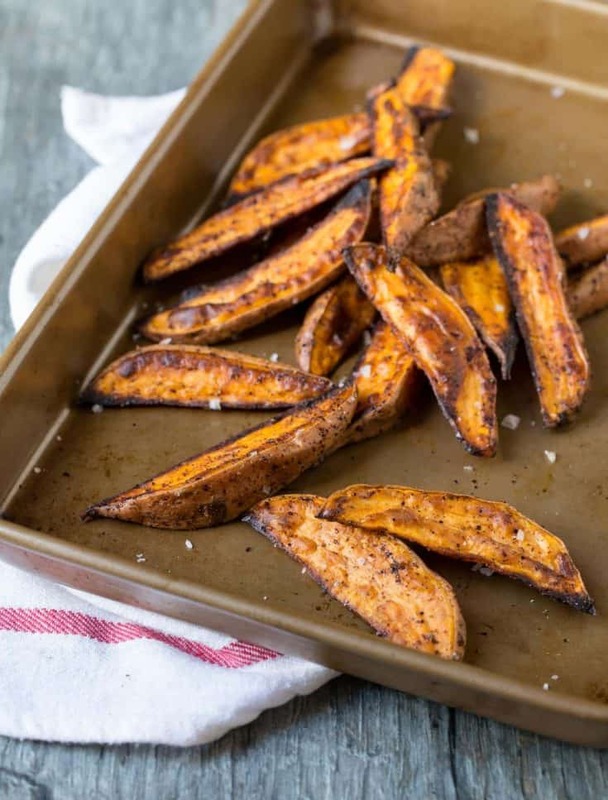 Now sweet potatoes are inherently, well, sweet, so we added a bit of spice to this recipe to put a delicious spin on these super simple Spicy Sweet Potato Wedges. Do your best to cut similarly sized potato wedges. I know, I know, potatoes have weird shapes sometimes, but keeping your cuts about the same size ensures the wedges are done cooking at about the same time. I like to use canola or grapeseed oil when I roast veggies. It has a higher smoke point than olive oil and can tolerate the high oven heat that roasting requires. Preheat your pans. Just pop them in the oven while it is preheating. The hot pan will give the roasting process a jumpstart. Don’t crowd the pan! It’s tempting to shove all the potatoes on one pan, but please don’t. Crowded veggies don’t get as much air circulation in the oven which means the veggies steam rather than roast. Crispy skins are a must with potato wedges! Rotate your pans halfway through cooking time. You probably already guessed that you should flip our veggies halfway through roasting, but since all ovens have hot spots, you’ll ensure a more even cooking time if you swap your pans at the same time you flip the wedges. If you’re a purist at heart, feel free to eat these wedges straight from the oven, but we highly recommend dipping them in a batch of our 2-ingredient Sriracha Aioli. Irresistible! Place two sheet pans in the oven and preheat oven to 425 degrees. Place potatoes in a large bowl and drizzle with oil. Stir to coat. Combine spices in a small bowl and sprinkle over potatoes. Stir to evenly coat. Place potatoes on preheated pans and bake for 22-25 minutes, rotating pans and flipping potatoes halfway through cooking time. Serve immediately.